The MDIFW Landowner Relations Program is actively working to enhance relationships between land owners and land users. With approximately 94% of the land in Maine privately owned, everyone MUST respect landowners and their rights. Landowner wishes have to be followed by all outdoor recreation participants to help ensure access and use of private property in the years to come. 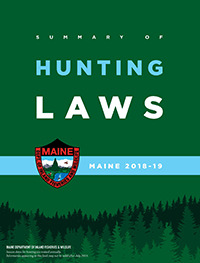 Summarized below are several laws enacted by the Maine Legislature addressing landowners' concerns. For more details, consult the Maine Revised Statutes cited in parenthesis. An owner, lessee, manager, holder of an easement or occupant of premises shall owe no duty of care to keep the premises safe for entry or use by others for recreational or harvesting activities or to give warning of any hazardous condition, use, structure or activity on these premises to persons entering for those purposes. This subsection applies regardless of whether permission has been given to pursue recreational or harvesting activities on the premises. When financial consideration is paid for the exclusive right to make use of the property for recreational activities. The court shall award any direct legal costs, including reasonable attorneys' fees, to an owner, lessee, manager, holder of an easement or occupant who is found not to be liable for injury to a person or property pursuant to this section. Signs must indicate that access is prohibited, that access is prohibited without permission of the landowner or landowner's agent, or that access for a particular activity is prohibited. One vertical "OSHA Safety Purple" stripe at least one inch in width and at least 8 inches in length means "Access by Permission Only" when it is placed on trees, posts or stones between three and five feet off the ground. These signs or paint stripes must mark the property at distances no more than 100 feet apart at locations that are readily visible to any person approaching the property, and at all vehicular access entries from a public road. Signs or paint markings must be at all vehicular access entrances from a public way. It is unlawful to post the land of another or to remove, destroy, mutilate or deface any signs or paint marks. Trespass by a motor vehicle is a violation of the trespass law. If the damage is intentional, the person doing the damage is liable to the owner for two times the actual damage, plus additional costs including attorneys' fees. If the damage is unintentional, the person doing the damage is liable to the owner for the amount of the actual damage plus additional including attorneys' fees. A person doing damage to property of another may also be charged criminally for doing the damage. It is unlawful for any person to intentionally, knowingly, recklessly or negligently cut down or fell any tree without the consent of the owner of the property on which the tree stands. It is unlawful to dispose of litter anywhere in this state except in areas or receptacles designed for that purpose. As litter relates to the proper disposal of legally taken game, a person may not drop, deposit, discard, dump or otherwise dispose of a carcass, waste parts or remains of a wild animal, except waste parts or remains resulting from the normal field dressing of lawfully harvested wild game or the lawful use of waste parts or remains of wild game as bait. Enter, remain in, or cause a projectile to enter or remain in any place in defiance of a lawful order not to enter or an order to vacate that was personally communicated to that person by the owner of the place or another authorized person. Definition of projectile: For the purposes of this section, "projectile" means a bullet, pellet, shot, shell, ball, arrow, bolt or other object propelled or launched from a firearm or a bow, crossbow or similar tensile device. A person may not charge any fee for access to land if the fee is contingent upon the taking of game on that land or directly related to the taking of game on the land, unless the land is an authorized commercial shooting area whose owner has been licensed by the commissioner to charge others for the opportunity to hunt mallard ducks, pheasants, quail, Chukar partridge, and Hungarian partridge (12 MRSA section 12101). The operator of a commercial shooting area may authorize a person to hunt other wild birds or wild animals in a commercial shooting area during the regular open season on those species, in accordance with the provisions of 12 MRSA Part 13, as long as the person possesses a valid state hunting license that allows the hunting of those wild birds and animals. The operator of the commercial shooting area shall provide to each person taking birds in that area a receipted invoice or bill of sale for possession and transportation of those birds. Enforcement of the trespass laws of a commercial shooting area is the responsibility of the owner and may not in any manner be considered an MDIFW obligation. For a complete copy of the law governing commercial shooting areas, and to obtain a list of commercial shooting areas, call MDIFW at (207) 287-8000.